In multiprocessor systems, a reasonable goal of the scheduler is to keep all processors as busy as possible. One technique for doing this is to allocate all available processors to the jobs waiting for service. Techniques which allocate all available processors are known as work-conserving policies. In this paper, non-work-conserving policies are examined. These policies keep some number of processors idle (i.e., unallocated) even when there are parallel jobs that are waiting for service. Such non-work-conserving policies set aside idle processors for anticipated new job arrivals or for unexpected system behavior. Two classes of non-work-conserving space-sharing policies are examined. One policy class keeps a certain percentage of the processors free. The other policy class makes an allocation decision based on previously observed system behavior. Two non-work-conserving policies, each selected from the two classes, are evaluated against their work-conserving counterparts. It is demonstrated that non-work-conserving policies can be particularly useful when the workload or the system behavior are irregular. 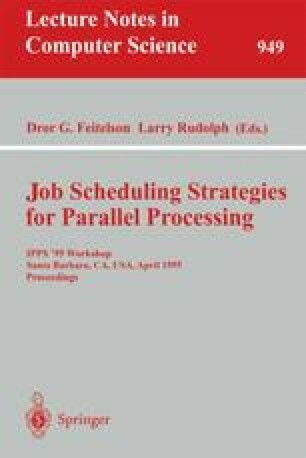 Variability in the workload behavior including bursty arrivals, a high coefficient of variation in the workload execution time, unstable systems with processor failures are among the situations where non-work-conserving policies improve performance. This work was partially supported by Italian M.U.R.S.T. 40% and 60% projects, and by sub-contract 19X-SL131V from the Oak Ridge National Laboratory managed by Martin Marietta Energy Systems, Inc. for the U.S. Department of Energy under contract no. DE-AC05-84OR21400.